this week our people will be a little bit different! After last week, where we could welcome a lot of new people in the INTERNeX-Family…We’re gonna meet in the Blarney Stone on Friday @ 6pm! As you may noticed the Vancouver Canucks have qualified for the Playoffs and it is time to fight….wohooo! GO CANUCKS! That’s why we are coming together to see the Game in Gastown. We are gonna WATCH THE PLAYOFFS ON A GIANT 20FT SCREEN!! – Got a jersey? Make sure to show your colors for either team and get a free drink on them! – Want a jersey? Come down and win one! – Want beer? Come down and win some! 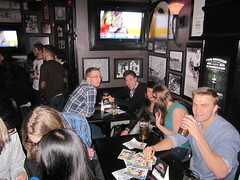 – $13.50 Bud Pitchers every game as well as amazing daily food and drink specials! After that Friday Night is on! Everbody is very welcome to stay, dance and drink… IT IS GONNA BE AN AWESOME NIGHT! to view the location, click here. It is time for Pub Night again, but this time it is going to be a little bit different… This Wednesday Santa is coming! 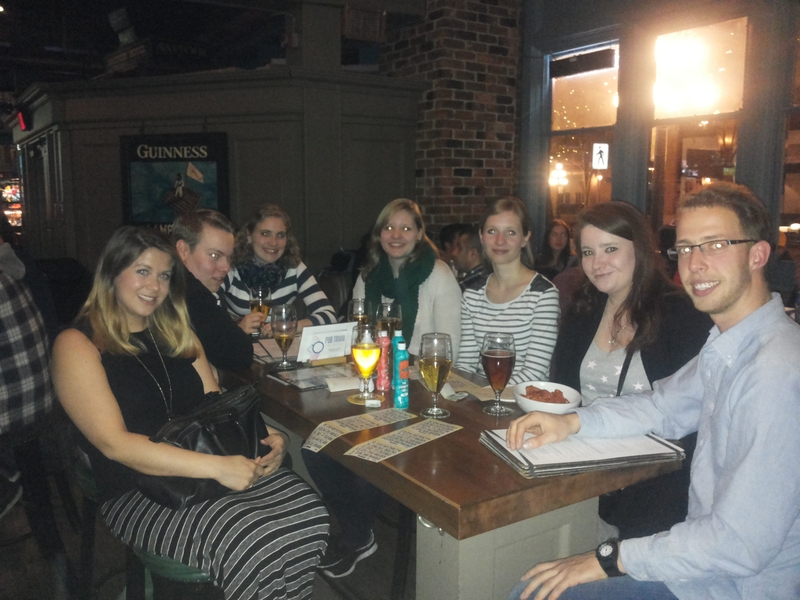 That’s why we will have our Pubnight on Tuesday, but NOT at 7pm like normal, we will meet at 4:30pm. View the location click here. You can also sign up on our Facebook page. Merry Christmas to all of you and we are really looking forward to see you! It’s almost the middle of the week, time to come together have a nice chat with some food and drinks with your INTERNeX Family and a great opportunity to meet the new gang from Germany. We choose this time for the Pint, which is located at 445 Abbott street, across the INTERNeX Office. The Pint is home to 40 different sauces and dry rubs to cover wings and ribs in. They also have 40+ HDTVs for all the games of the Canucks, Lions and Whitecaps. The Pint has some pretty good deals if you want to go for a hungover Brunch on a weekend or holiday. The brunch is from 11am till 4pm for $10 and if you went to the Pint the day before to party and how your ‘last nights’ stamp you will get another 50% off. We will meet at 7pm in the Pint, just look for a big group of Germans and you will find us. Click here to join the Facebook event. If you want you can also pay for any of the upcoming events, however we prefer if you want to pay for the Rockies to stop by the office on workdays (mon-fri) between 10am and 5pm. We hope we will see you tomorrow night! 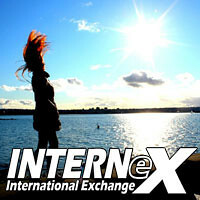 INTERNeX Canada: HiGHLiGHTS of the Week Ep10! This week we present the special Highlights of the Week Ep. 10! As you can imagine we spend a lot of time preparing every single episode of our weekly YouTube show. Not all the time things go as planed and for our 10th episode we thought it might be funny to show you what went wrong while filming the Hotw and the INTERNeX EXPLOReR. I’d like to use this afternoon to announce the pub night for tomorrow! 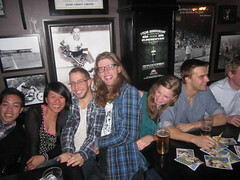 We will go to the Blarney Stone in Gastown, and have some drinks together. There will be a big cycling race event in Gastown tomorrow..‘The Global Relay Gastown Grand Prix’ is a big spectacle and if you want to see the racers you can come earlier! From 5:45pm till 9:15pm will be full of races and people in the area of Carrall St, Gastown! Sounds awesome, right? We hope to see all of you tomorrow, and remember to join us in our Facebook Event! WHEN: Wednesday 10th at 7:30 pm. We would like to present the new episode of HiGHLiGHTS of the week. This week was a special week because of Canada Day on monday! As you can see in our picture of the week we prepared well for this real Canadian party. So we tried some red and white outfits in the office! 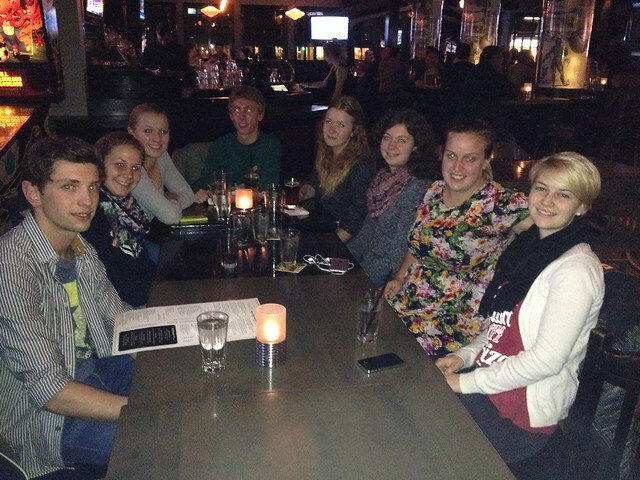 Last Wednesday for our weekly PuB NiGHT we went to the Cambie Bar in Gastown. We spend a wonderfull night drinking beer and eating hamburgers outside on the terrace. Thanks for coming and joining us! This week we are doing a special episode (mostly made for the girls) of the INTERNeX Explorer. Mercedes went to see Craig in his salon tangledthoughts.ca. He is one of the best hairdressers in Vancouver, enjoy! First Mercedes got a hair massage. After that her hair was washed with a shampoo specific for her hair type. Then it was time to exactly cut her hair. Not to much, only taking of the end. This makes the hair a lot easier to manage. The next thing was to dry the hair carefully, and brush it of course. Mercedes was very happy with her new hair style! But she also asked you; so what do you think? 😉 Do you like it? If you have any questions about the products that where used by Craig you can check out his blog. You can even get some coupons there! Today we are celebrating the weekend and enjoying the beautiful weather in Queen Elizabeth Park. Thanks for the people that joined us there! The next thing we want to talk about is of course the upcoming Rocky Mountains trip in the long weekend of August! All the information about this trip can be found on our Facebook or our blog. We already looking forward for this one, more updates will be following soon, so stay tuned! You can reserve YOUR SPOT now. 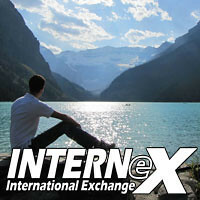 Last week we INTERNeX, and West Trek announced the amazing 4 days Rockies trip in the beginning of August! Today we want to give you some more information about the trip, and the special price we have for you. We will leave on Friday August 2nd from Vancouver with a big bus. 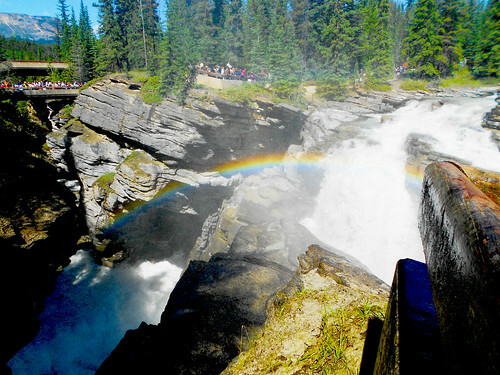 The next couple of days we will visit amazing places like Jasper, Banff, Lake Louise and much, much more!! At night there will be time to party. We give you free entrance to one of the best places in Banff and other cities we visit.. On Monday evening August 5th we will arrive back in Vancouver after 4 days of FUN. This will be a life time experience for everybody!! Do not forget to keep an eye on our blog and Facebook. We will reveal more information soon!